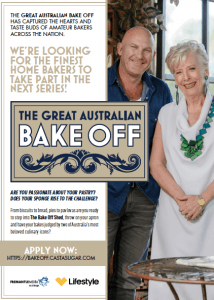 Fremantle Media producers of the TV series THE GREAT AUSTRALIA BAKE-OFF are casting the next series and are looking for talented bakers. Dab hands with pies, pastries, crusty loaves, cookies and cakes all count. So if you make and sell baked goods in a farmers’ market – or know shoppers who are keen on flour power and fancy their baking talent, suggest they check out the casting process. Applications close end February.